Secession definition: The withdrawal of a state from the Union. Just as the original thirteen colonies fought for their independence almost 100 years earlier, the Southern states felt a growing need for absolute freedom from the central Federal authority in Washington. This topic was referred to as Secession. On July, 4, 1776, it stated in the Declaration of Independence by the thirteen colonies: "That these United Colonies are, and of right ought to be, FREE AND INDEPENDENT STATES...and that, as free and independent States, they have full power to levy war, conclude peace, contract alliances, establish commerce, and to do all other acts and things which independent States may of right do." 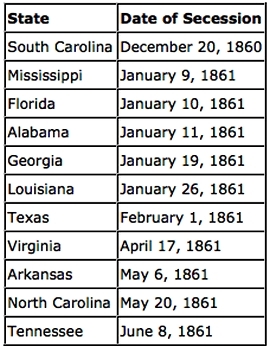 The right of secession was also regarded by the seceding states as one of their sovereign powers as bequeathed in the Bill of Rights to the United States Constitution. The U.S. Constitution, furthermore, contained no prohibition in this respect nor conferred any power on the Federal government to compel a state to remain in the Union against its wishes. The legality of the concept was, however, always disputed by the Federal government. To this day, the debate of Secession remains a heated topic. Notes: The Tennessee legislature sent to referendum its DECLARATION OF INDEPENDENCE AND ORDINANCE dissolving the federal relations between the State of Tennessee and the United States of America on May 6, 1861, and it was approved by the voters, 104,471 to 47,183, on June 8, 1861. He argues that although Northerners' reactions to Southern secession were understood and expressed through partisan newspapers and officials, the decision fell into the hands of an ever-smaller handful of people until finally it was Abraham Lincoln alone who would choose whether the future of the American republic was to be determined through peace or a sword.